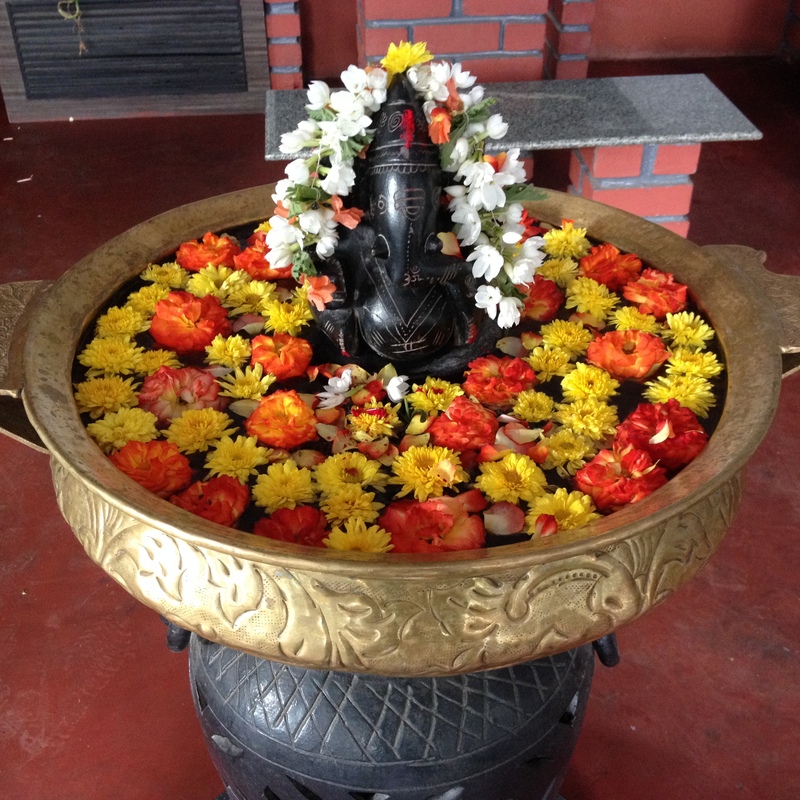 Last week I arrived in Bangalore. After a thrilling week in India, I am glad I had the courage to book a last-minute flight to Bangalore once I was told that I had to wait for two more months for my U.S. working visa. 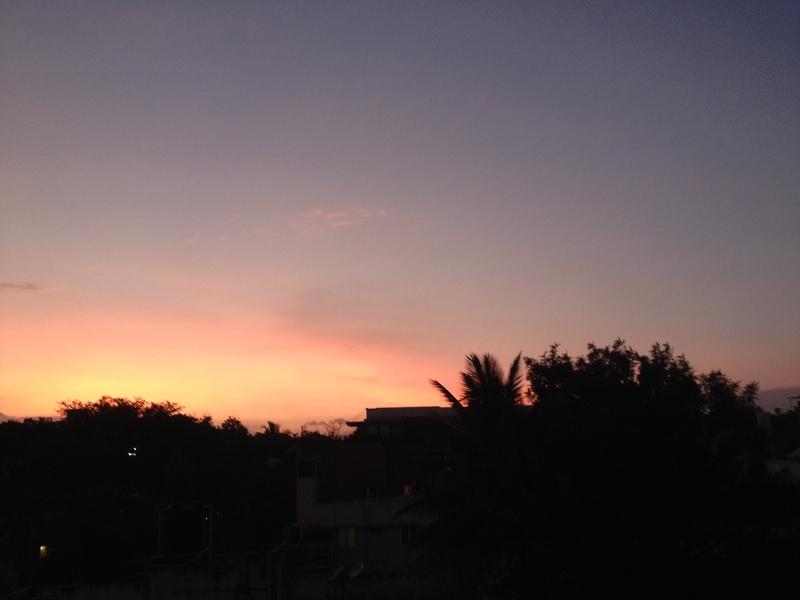 Adjusting to life in Bangalore is easy. Many speak English and tasty food is available on every street corner. Several great groups of people invited me to work with them, bringing meaning to my days in India from the moment I arrived. I stay with wonderful friends who double as great hosts. I go to sleep every night having learnt at least three new things. Buildings shoot from the ground everywhere, although access to a proper home is unevenly distributed. 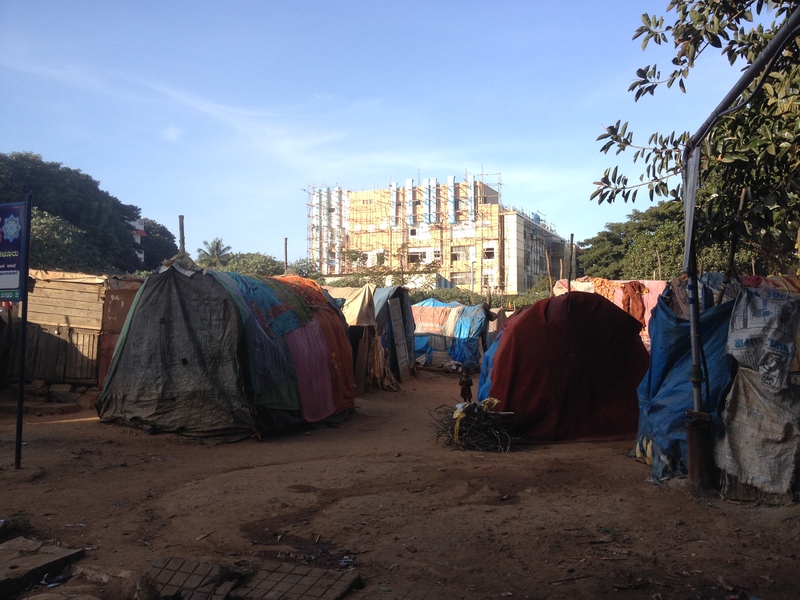 The picture below shows a tent community in front of a newly erected building. 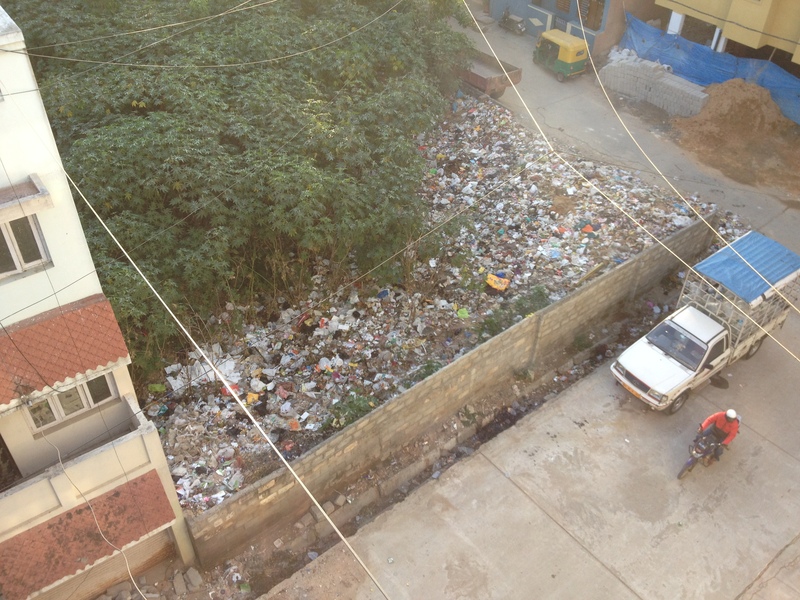 Bangalore’s streets are surprisingly clean, but waste’s final destination may be nearer than you think. I was surprised to discover this garden with integrated garbage dump one morning as I woke up to watch the sun rise from my roof terrace in Indira Nagar. Transport in Bangalore is hectic. The first days I traveled by riksha (called “autos”, I actually drove one an auto last Sunday evening), but I quickly decided to test the public bus system. 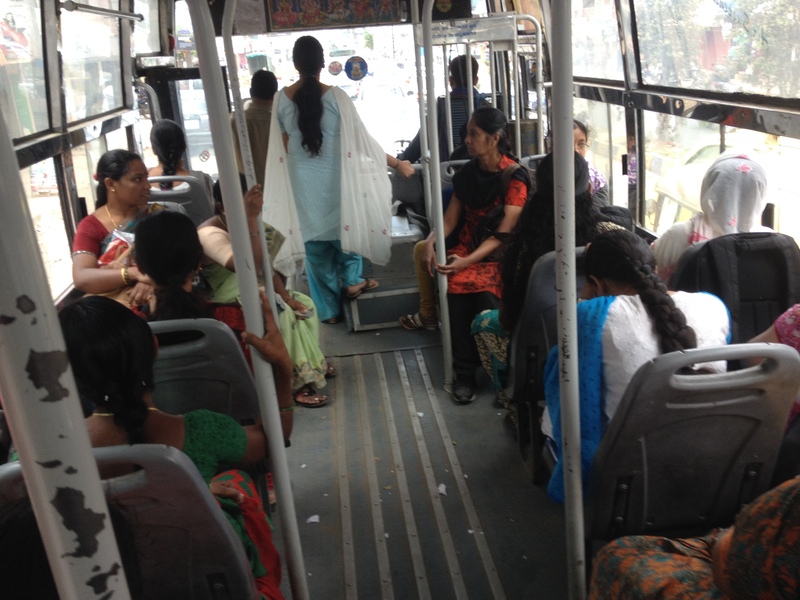 Boarding the bus on my first ride, I was surprised to see only women sitting! When I turned my head to look towards the rear of the bus, I realized that all men were sitting in the back. This is an unspoken rule I’ve observed on buses since, so that women have a place to sit. I wonder how it was first implemented. On Wednesday and Sunday I went out into Bangalore’s tent-communities (slums) with the wonderful fellows and interns of Pollinate Energy. Pollinate provides access to electricity to people who do not have access to the grid. They do this by recruiting entrepreneurial twenty-year-olds from local urban communities – called Pollinators – to sell products that people want: solar panels, lights integrated with mobile-phone chargers, cookstoves and possibly soon modular homes; tablets and low-voltage TVs. I quickly learned that it is essential to work with local entrepreneurs if you are to sell products. When I enter a community – a European with blonde hair and white skin who speaks not a word of Kannada – it stirs up many reactions, yet these do not necessarily lead to an interest in the service we are trying to provide. 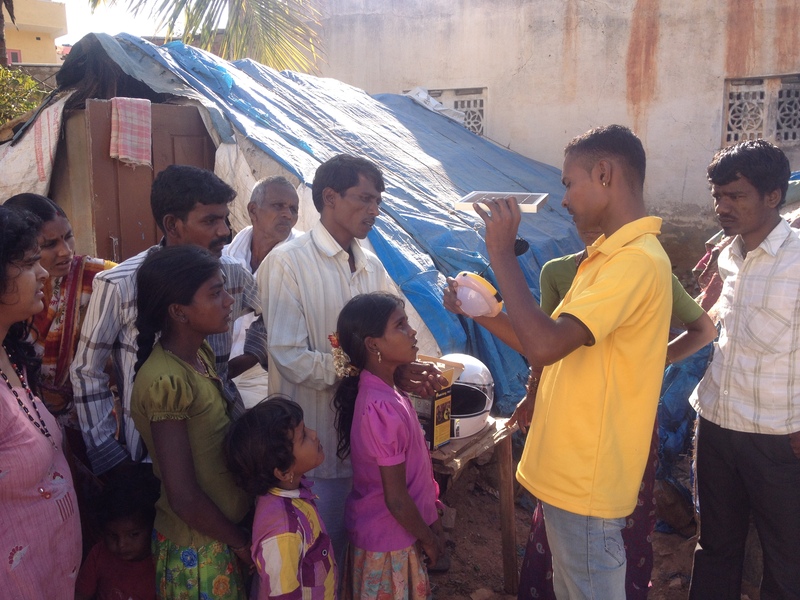 The real value is created by someone the community can trust – a boy like Madu in the picture below, who gently explains the benefits of not using kerosene. What is important is that the community can trust the storyteller. I also learned that people’s dis-interest in an electricity-providing product can have many more reasons than poor product design. In two days, I have heard people explain that they fear that the solar panel will be stolen; that neighbors will destroy the solar lantern; or that they simply do not want to be the first of their friends to buy the product. After Wednesday’s visit to the slum, Monique and Jamie from Pollinate invited me to participate in Bangalore’s midnight marathon run – the 10km version, not the original Greek length – on Saturday night. 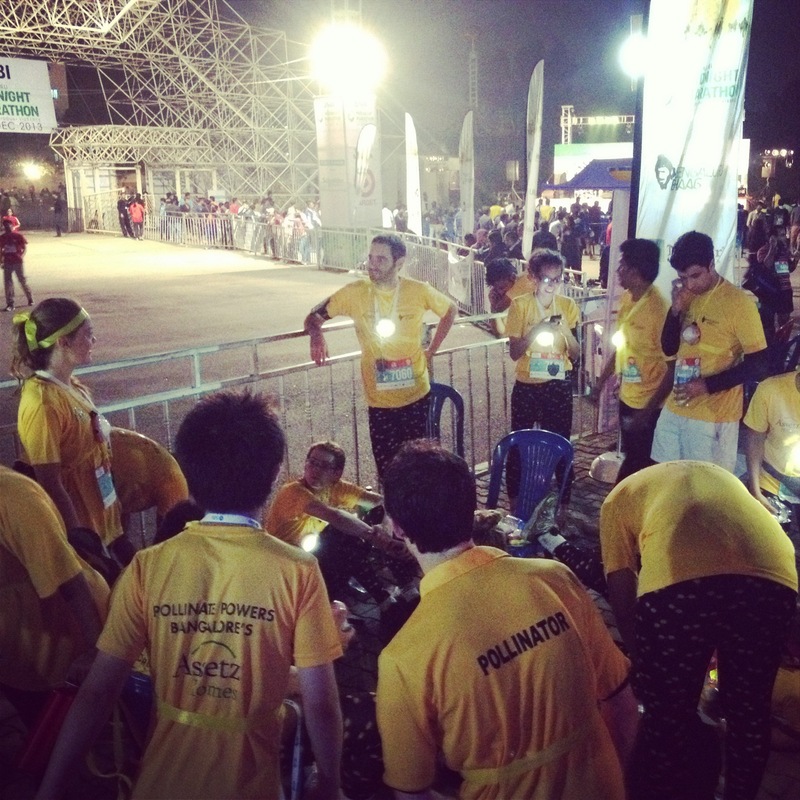 Dressed up as light-emitting bees (yellow shirts, black tights, LED-light strapped to our chest) more than twenty of completed the track in Whitefields – cheering and screaming to one another as we passed. I spent the last two days with Infosys’ Green Initiatives team. Under the leadership of Rohan Parikh, this group of 15 very competent engineers are committed to realizing the world’s most energy-efficient buildings. Since 2008 the team has reduced energy consumption in new buildings by almost 50%. My goal is to work with part of the team to realize a bold project in the next five weeks.